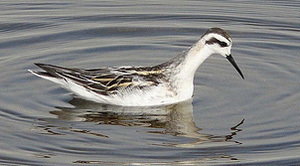 Like other Phalaropes the male and female have reversed roles, females are brighter than males. 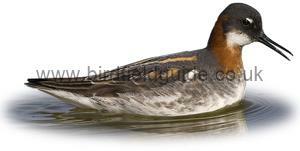 In summer plumage the female has a dark black head with chestnut-red neck, white throat, and dark upperparts. The back of the bird has buff stripes running along the mantle. Another Red-Necked Phalarope in moult, note the tinge of buff on the sides of the neck. The black eye patch and cap are well defined, note the very thin dark bill, which never has any yellow on it, unlike the Grey Phalarope. The Red-Necked Phalarope is not often seen in Europe whilst in winter plumage, most often it is in breeding plumage, or a state of moult as this image shows. Note the back feathers with buff edging and the darker cap. The black eye patch curves down and along the neck, one of the best indicators of identity, and present in every stage of plumage. The white wing bars of the Red-Necked Phalarope are visible regardless of the season. Even in winter when the birds backs are very pale, the wing bars are still visible. These birds are in moult, not the distinctive eye patches pointing down the neck, and the buff stripes on the birds back. In winter the Red-Necked Phalarope has grey upperparts, with some feathers having black centres and white fringes. It's underside is pure white. It has a distinctive black patch behind the eye and it's bill is dark and very thin. 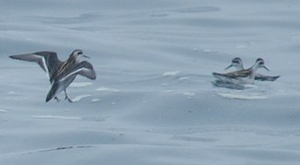 The shape of the eye patch helps to distinguish it from the Grey Phalarope. Summer visitor, breeding in Northern Europe and right across the Arctic fringe. A regular but rare breeder in the UK, with around 22 pair nesting. Winters in the Southern oceans, migrating overland to get there. Nests near grassy ponds and marshes from sea level to 1300m, often a long way from the sea. It spends the winter at sea, mostly in the tropics. 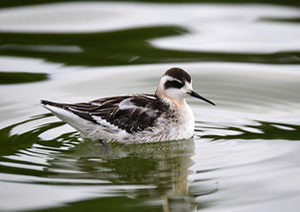 The Red-necked Phalarope is one of the tamest birds a birdwatcher is likely to encounter, almost completely indifferent to people. It is rarely seen in Europe during the winter. 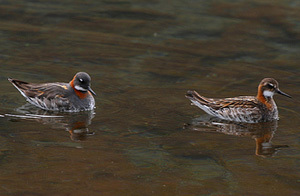 A male and female Red-Necked Phalarope, note the males duller head and neck. The male Red-Necked Phalarope has a greyish head, and a generally duller appearance than the female. He often has white marks in front of the eye. Red-Necked Phalarope in summer plumage. 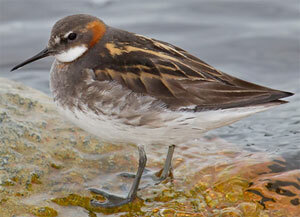 Rare footage of a Red-Necked Phalarope in full winter plumage.